An extremely beautiful design that is intricate is depicted in applique work fabrics for gowns. A unique combination of beads and lace can be seen in the design thus making it a treat for the eyes. Small beads have been stitched to the satin fabric with the help of fine threads that are extremely smooth and durable at the same time. 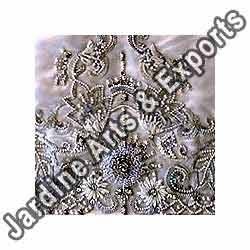 Small sequins interestingly put together to get a beautiful sequin embroidered fabrics that makes it a perfect apparel for the bride on her wedding. The design has small detailing like bunch of flowers clubbed together at intervals to give a charming look. Each bunch is connected with a series of sequins thus making the pattern look attractive. 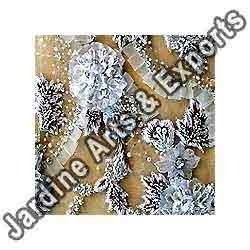 Looking for Wedding Gown Embroidery ?